CCTV images of the moment a convicted murderer escaped during a hospital visit have been released by police. Shaun Walmsley, 28, was getting into a cab with prison officers when he was sprung from custody by two armed men. The getaway car had lain in wait in a road near Liverpool's Aintree University Hospital, police said. A number of people in the area may not have realised what was going on during the escape on Tuesday, police said, as they appealed for witnesses to contact them. Officers believe a gold-coloured Volvo had been parked on Adlam Crescent, Fazakerley, from around 12:00 GMT before travelling to and parking at the hospital from about 13:30. The car was found in Adlam Crescent at 20:00 on Tuesday and is being examined by officers. Det Supt Natalie Perischine said: "We do know that the gold Volvo was blocking the rear of the car which was meant to take Walmsley back to prison, and this was making access to a roundabout at the hospital difficult. 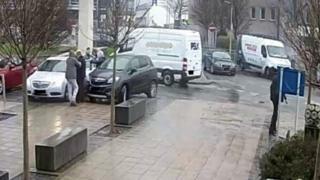 "One delivery driver was forced to mount the kerb to get past. She added: "The CCTV shows that the people involved in the actual incident were in a very close huddle and we know that although a gun and knife were used by the offenders, they were not blatantly on show to other people walking by." Walmsley, described as "highly dangerous", is one of four men serving life sentences for the "vicious and savage" stabbing of Anthony Duffy in 2014.